The Nine Emperor Gods festival usually occur in the month of October in the English calendar (it falls from the 1st to the 9th day of the Chinese lunar calendar). During this time, some Chinese folks may go on a vegetarian diet. It is interesting to observe that some members of the Indian and Thai community also go on a vegetarian diet- which began around the same time. If I can, I usually try to go for vegetarian diet during the 9 days. Actually I’ve gone on vegetarian diet during the 9 Emperor Gods festival not because I celebrate it but to join a friend who was on vegatarian. After that, I found that it is quite interesting as it gives me a reason to go on vegetarian for health reasons and to control my temper 🙂 and surceptibility towards stress. PJ Old Town- there is an old looking restaurant located next to Restaurant Jin Xuan Hong Kong (dim sum shop in PJ Old Town) and opposite Yi Poh Restaurant. The restaurant is in a house like structure with zinc roof. Inside the restaurant, there is a stall that sells Chinese vegetarian dishes at affordable price. On observation days, sometimes you get popiah, or some nice fried pumpkin to go with your food. Restoran Cafe De Sky Garden (6, 8, 10, 12, 14 & 16, Jalan PJS 1/31 & PJS 1, Taman Petaling Utama, 46150 Petaling Jaya) located off Klang Road. I have been to this restaurant a few times…. the ambiance and variety of food served is awesome. They have a huge variety of vegetarian dishes including Chinese and Western dishes. Also various types of drinks- some that taste like champagne but is actually non alcoholic. just buy veges, taufu, mushrooms and probably some vegetarian fishballs and cook some simple dishes. I would buy the pau and vegetarian char siew pau from either the frozen food supplier or hypermarkets. 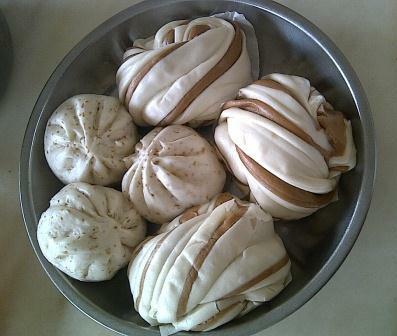 Generally, you can find mantau (blank pau with no fillings) from hypermarkets. Just need to take them out from packaging from the fridge and steam them for 10 minutes before eating. 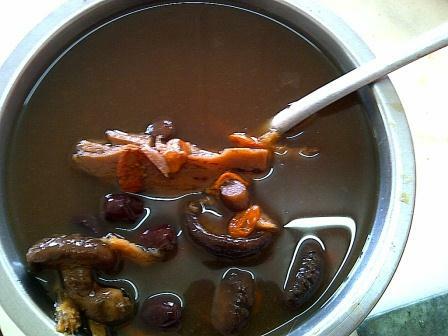 Above is nutritious soup made from lotus root, mushrooms, dried wolfberry herbs (red colour) and dried red dates- boiled slowly using a slow cooker made of clay. Cook for about 6 hours till the soup thickens- after drinking, you would feel your body more warm. 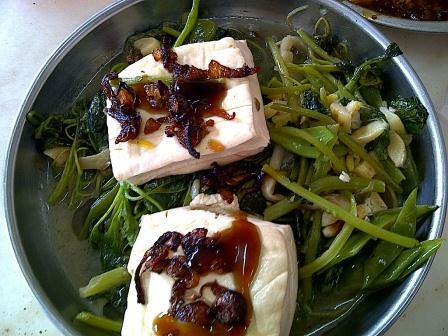 Above: Simple dish of spinach with taufu. First stir fry the garlic with a bit of oil and then cook the spinach with taufu.